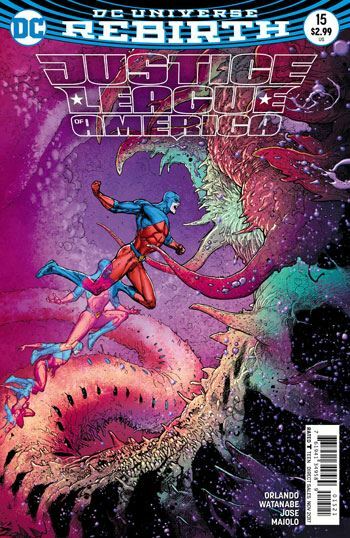 This issue of Justice League of America is really a solo Atom story, featuring Ray Palmer. 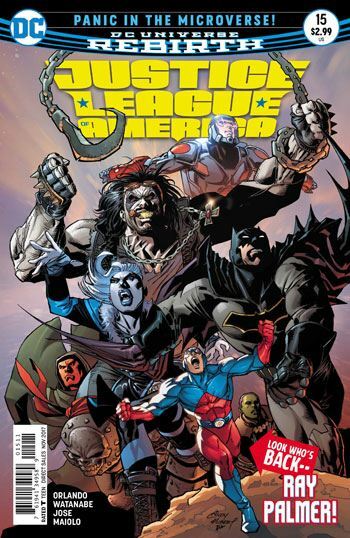 It’s not in the wrong book, it’s just that this chapter of the larger tale is completely devoted to having Ray Palmer explain to the Justice League what he has been up to, even since he entered the microverse. Now, science has never been my strong suit. I still don’t understand how lightbulbs work. So I am really not the one to be able to comment on all the science-y things that happen in this story. Going into the quantum realm of a quantum realm and such. It all sounds fine to me, but people who actually understand this stuff will know if Orlando is being impressively knowledgeable, or is just making stuff up. Thankfully, Orlando is very skilled at conveying the lives and emotions of his characters, and so I can very much follow Ray’s romantic plot thread, which builds as the microverse falls apart. The art on this issue is good, although not quite what it was in the earlier chapters. I just don’t care for the faces quite as much. The one thing that really really does not work for me is the final page. Without any spoilers, some characters are left looking at something that really shocks them. What are they looking at? Well, I guess we will find out next issue. I definitely would have preferred a stronger ending that a group of stunned looking people, who can see something that I cannot.